Blackjack is currently one of the most popular casino games along with slots and poker, the simplicity of the games and their high intensity makes them so popular. ReviewBlackjack.com gives players the best information on the rules, strategies and tips needed to win at online blackjack. Learn how to hit, stand, and take insurance at ReviewBlackjack.com today. When playing Blackjack, either online or in a casino, there are some pretty basic things to keep in mind. The object of the game, is to get closer to 21, without going over 21, than the house, or the dealer. All cards have face value, all face cards are valued at ten and aces can be counted as one or eleven. How to play blackjack? The game starts by you placing a wager for the next hand to be dealt. You will be dealt two cards, as well as the dealer, but you will only see one of the dealer’s cards, which is called an “up card”. You will be given the option to; hit, stand, split or double down. Hitting would mean you will receive an additional card, standing you would not receive any additional cards, splitting a pair, such as eight’s or ace’s means you would have to match your original wager and the pair gets split in to two separate hands, or double down, which means you could place a second bet, up to the amount of your original bet, to receive only one additional card. After everyone has executed their decisions for their hands, the dealer goes last, if the dealer breaks, everyone left in the hand will get paid, one to one odds, otherwise each person’s bet will be taken or paid, depending upon their card total, in relation to the dealer’s card total. Closer to 21 wins, 22, or higher loses, every time. If you get a “Blackjack” or a “Natural 21” you would get paid three to two odds, or “time and a half” if the dealer does not also have a “Blackjack” or “Natural 21” of his or her own, if they do, it’s a “push” or a tie. A “Blackjack” or “Natural 21” is when your initial two cards are an ace and a ten valued card. If you get a “Blackjack” and the dealer’s up card is an Ace, you will most likely be offered the option to accept, “Even Money” which means you can decide to not find out if the dealer/house has a “Blackjack” as well, but rather you take one to one odds immediately, forfeiting your pay off of three to two odds. There is also a time where you maybe offered to “take insurance”. 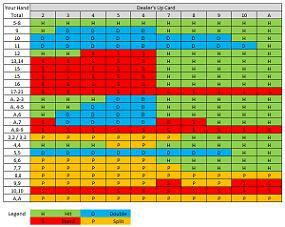 This means the dealer has an Ace for an up card and could possibly have a “Blackjack”. By “taking insurance” you are placing a second bet, up to half of your original bet, betting that the dealer/house has a “Blackjack”. If you do place this bet, and the dealer does have a “Blackjack” you will lose your original bet, but get paid two to one odds on your insurance bet, meaning you have just broken even. Most “basic strategy” players will suggest against taking this bet, the odds are against you, if you wager on the dealer/house having the “Blackjack”. There maybe other players at the table, either an online table or casino table, but those players are simply playing against the dealer/house as well, so you do not have to worry about the outcome of their hands, you are only playing against the house/dealer. These are just the basics of how the game is played. The game, itself is rather simple and fast paced, but you can take the game to the next level and play a much more advanced strategy, but for the average player, at least in the beginning will be looking to play “basic strategy” for the game of Blackjack. To play “basic strategy” you can go in to most casino gift shops, or look around a little online, and find a credit card sized, pocket card, that has a multicolor chart on it, that will show you when it is most advised to hit, stand, split or double down. The card’s advice is based upon calculated odds. The card is rather inexpensive, and well worth the purchase. Basic strategy will not make you rich, but will hopefully minimize your losses and give you a better understanding of the odds involved in the game. For more information see our Blackjack Rules page for a more in-depth information on playing blackjack. Find the best online casinos for playing blackjack and also claim some huge bonuses when you sign up. If you live in the USA check out www.usablackjackcasinos.com for a complete guide to the best USA online blackjack casinos. If you also like to play other casino games and slots these online casinos also offer a full variety. Most online casinos offer software that you can either download to your computer or simply play using flash software. These flash or instant play casinos are great for Mac users and players who want to use their mobile device to play online blackjack. If you do not want to download software to your computer see a listing of Instant Play Casinos and use your mobile to play. These casinos offer just as good an experience as if you downloaded the casino to your computer. Also be sure to check out online live dealer blackjack. Live dealer blackjack allows you to play at a brick and mortar casino using a live streaming feed to see the dealer and the table. You play at an actual casino and an actual real live person deals the cards. Live dealer play is the latest advent for online casinos and it is a lot of fun. See more on playing live dealer blackjack and USA live dealer blackjack if you live in the United States and the online casinos that offer it. Unfortunately there is not not many USA live blackjack online casinos yet with the popularity of the game we are sure more online casinos will be offering it soon. What is a Progressive Blackjack and How to Play It? What Is European Blackjack and How to Play It? What Types of Blackjack Are There? What is the House Edge at Blackjack?